Jael Paris and I took a trip to the mall on Sunday in hopes of digging up topics to blog about. Jael suggested I visit a store I wouldn't normally shop at to see if they had anything worth while. We were standing near Hot Topic at the moment so I wandered in hoping to find a few goth inspired items to mix with my girlish wardrobe. After struggling past the wall of Twilight merchandise at the front of the store, I picked through the clothing where I found nothing. The accessories department seemed to be the only section worth while. If you're looking for anything cheap and neon, this is your place. They also had a good selection of crazy tights (always fun!). There were also a few pairs of intriguing fingerless gloves. My favorite finds were a pair of feather false eyelashes and colorful petticoats (although they are a bit shorter than I'd like). So, if you're looking to experiment with accessories, Hot Topic has some affordable options. 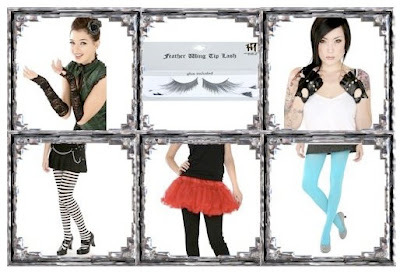 If you're looking for some cool goth-inspired apparel though, you'll have to look elsewhere. I love the eyelashes. Those would be neat to do a mod makeup look with.